In our Artechne project we investigate technique in the Arts. My research is focused on pigments; more specifically, I study how chemical analyses of pigments influenced conservation practice during the long 19th century. But where do pigments come from? How were they commercialized and which were they trading routes? This entry presents a short overview about a specific pigment, the cochineal red, and how it was used by the American pre-Hispanic cultures and introduced into Europe. 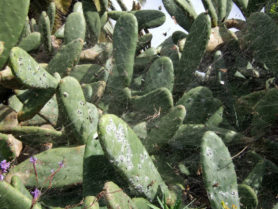 A cactus species -commonly known as prickly pear- is the host for an insect which was extensively used for the production of a pigment and dye: the cochineal red. Both the plant and the insect species are originally from the American continent. The cochineal red pigment adopts the name from the Spanish term cochinilla. This pigment is obtained from an adult female scale insect (its scientific name is Dactylopius coccus). These small beetles spread over the cactus´ surface and feed from it, establishing a parasitic relationship with the plant. Different types of cactus species were grown in the American continent with the purpose of farming the cochineal insect. The most frequently used was the prickly pear (its scientific name is Opuntia ficus-indica). Extensive farming and use of the cochineal were mainly located in two large areas. In the Peruvian Andes the cochineal was protected and harvested for its use as a pigment and dye. Not only the Incas, but also pre-Inca cultures were aware of their practical applications. Textiles with cochineal dyes were identified since the end of the Paracas Period (around the third century BC). In the Huari and Tiahuanaco periods (between 700 and 1.100 AD) the dye seems to be more frequent. Also the pre-Hispanic cultures from the actual Mexico protected the insect and created a well-developed farming system for this purpose. The female cochineals are collected when they are full of eggs, before hatching. The harvesting takes place biannually, during the months of May and July. Afterwards, they are killed using different methods: with hot steam, products like vinegar or with heat (in case they are dried in the oven). If no ovens are used, the dead insects have to be dried under the sun, which slows down the whole pigment production process. Once the drying is complete, the net weight is reduced to a 30%. Cochineal insects may contain up to a 20% of carminic acid , which is the colouring matter. Carminic red is not the only colour resultant from the cochineal pigment. Different colours can be obtained by varying the mordant. This information was already known by both the pre-Hispanic cultures and the Europeans and was used for dyeing textiles obtaining a diverse variety of tones (for instance, lead acetate and copper sulphate will produce a violet colour instead of a bright red). Furthermore, more variations can be obtained by changing the pH of the dye-baths. If the mordant is alum, a blue precipitate will be the resultant of an alkali solution while acids will produce a yellow colour. Fig. 1: Collection of female cochineals with a deer tale for the preparation of red pigment during the colonial period in the American continent (image from Wikimedia Commons). Soon after their arrival to America, the Spanish people understood the great potential of this pigment. Its production was highly encouraged and intensified during the whole colonial period and was marketed in Europe from the 16th century under the name of grana fina. By the year 1.565AD, 115 tonnes of cochineal pigment were exported annually to Spain. By the end of the century, the pigment was being sold to Venice, Persia and even more remote places like Central Asia. The American cochineal significantly influenced the European dyeing industry. It was not only applied on silk, but was also fundamental in the dyeing of woolen cloth, which was a well-developed industry at the time. One of the main reasons was that the new pigment allowed important savings: the high concentrations of colour matter contained by the cochineal decreased the use of dye per cloth. The cochineal pigment also allowed the production of more than 20 new varieties of colours that could be offered to customers. Due to such excellent characteristics, quality tests were performed on the pigment before its purchase and use. Furthermore, this pigment was widely imported by the Middle and Far East. The trade routes were diverse: from Spain through Venice and then to the East. Some routes would go through the Levant into Persia while others would reach the city of Aleppo. The route from Constantinople and the ports of the Black Sea would reach the Caspian region. Fig. 2: Female cochineals spread on the surface of the cactus (image from Wikimedia Commons). Cardon, D. 2007. Natural Dyes. Sources, Tradition, Technology and Science. London: Archetype. Donkin, R.A. 1977. 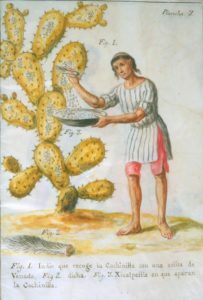 “Spanish red: An Ethnogeographical Study of Cochineal and the Opuntia Cactus” in Transactions of the American Philosophical Society. Volume 67, issue 5. 1-84. Eastaugh, N., V. Walsh, T. Chaplin & R. Siddall. 2008. Pigment Compendium. A Dictionary and Optical Microscopy of Historical Pigments. Oxford: Butterworth-Heinemann. Hofenk de Graaff, J. H. 2007. The Colourful Past. 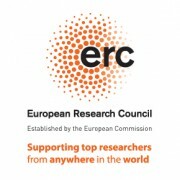 Origins, Chemistry and Identification of Natural Dyestuffs. London: Archetype. Phipps, E. 2010. ‘The Art History of a Color’, in The Metropolitan Museum of Art Bulletin. Volume 67, issue 3. 4-48. The mordant is a metallic salt used in the process of dyeing in order to help the colorant and the textile to bond properly, assuring the durability of the colour within the life cycle of the textile.